Alistair Darling, currently acting as Shadow Chancellor of the Exchequer was born in 1953 in London. After he completed the Loretto School, Musselburgh, he was admitted to the University of Aberdeen where he graduated in 1976. In 1978, he became a solicitor and in 1984, he was admitted to the Faculty of Advocates (a body of independent lawyers who practise law as Advocates before the Courts of Scotland). Darling entered politics in 1982 when he was elected Councillor to the Lothian Regional Council and served as Chairman of the Transport Committee from 1986 to 1987. In 1987, Darling was elected as Member of Parliament for Edinburgh Central and has been elected ever since until 2005 when the Edinburgh Central was abolished. Since 2005, he is Member of Parliament for Edinburgh South West. In 1987, Darling managed to defeat the Conservative Member of Parliament Sir Alexander Fletcher, however, his Labour Party did not managed to defeat the Conservatives led by Margaret Thatcher. From 1988 to 1992, he was opposition spokesman for Home Affairs. During the next mandate from 1992 to 1996, he served as opposition spokesman for Treasury Economic Affairs and the City. One year before the 1997 General Election, he became Shadow Chief Secretary to the Treasury. The Labour Party led by Tony Blair finally defeated the Conservative Party in 1997 and Alistair Darling became Chief Secretary to the Treasury. One year later, he replaced Harriet Harman as Secretary of State for Social Security and held the office until the 2001 when he became Secretary of State for Work and Pensions. One year later, he was appointed Secretary of State for Transport and held the office until 2006. 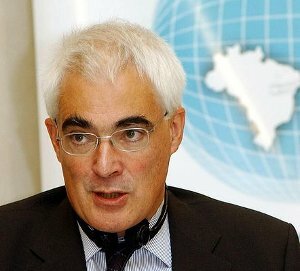 From 2003 to 2006, Darling also served as Secretary of State for Scotland. After being re-elected as Member of Parliament (this time for Edinburgh South West) in 2005, he became Secretary of State for Trade and Industry. After Tony Blair’s resignation as Prime Minister in June 2007, his successor Gordon Brown appointed Darling as Chancellor of the Exchequer. He took over the office in very difficult times for both the Labour Party and the British economy. Darling was re-elected as Member of Parliament in the 2010 General Election, however, the British voters decided for David Cameron’s Conservative Party instead. After the defeat of the Labour Party at the 2010 General Election, Darling announced to take a “year out” from the front bench politics but he is officially Shadow Chancellor of the Exchequer since May 2010 and of course, Member of Parliament for Edinburgh South West. In 2011, he published his memoirs of the time he was Chancellor of the Exchequer titled Back from the Brink: 1,000 Days at Number 11. The book mainly deals with the government’s response to the financial crisis but it also reveals a lot about the atmosphere in the Labour Party under Gordon Brown. Please note: We are not affiliated with Mr Alistair Darling in any way. This is just an informational site. If you wish to contact Mr Darling yourself, you will find his contact details HERE.